Upper Yosemite Fall is a magnificent sight at any time of year, but especially so during late spring, during the time of maximum snow melt. It is the seventh highest waterfall in the world, or part of the third highest if the lower fall is included. 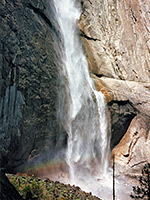 The cascade is visible for several miles up and down the valley, part of a two-stage drop of 2,400 feet as Yosemite Creek emerges from miles of gentle meandering across the Eagle Creek meadows in the high Alpine backcountry north of Yosemite Valley and flows over the towering granite cliffs to meet the Merced River far below. Such is the height of the falls that the water fans out during its descent and returns to earth in a series of pulses and wind-blown spray, covering quite a large area. Yosemite Falls topographic map, Yosemite Valley trails. A 3.6 mile path leads to the top of the fall and links with other cross-country trails, to Eagle Peak, El Capitan, North Dome and the Tioga Road. The route starts 0.6 miles west of the path to the Lower Fall, from a parking area near the Sunnyside walk-in campground (know known officially as Camp 4), reached by shuttlebus stop number 7 - see East Yosemite Valley map. 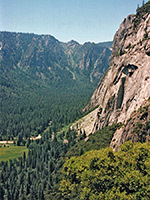 For half a mile it climbs steeply with many switchbacks through dense pine woodland, until, after gaining 1,000 feet in elevation, the path becomes more level and traverses the cliff face eastwards towards Yosemite Creek. The land is now sandy and more open, allowing for impressive views along the valley, especially from Columbia Rock, an overhanging promontory that is a good target for a short hike. Further along the trail, Upper Yosemite Fall can be heard some distance before it is visible, and comes in to view quite suddenly around a bend in the path. The lower fall remains out of sight, hidden by a rocky ledge. The main path comes within 50 yards of the base of the upper waterfall but passes through woodland at this point and so the best views are obtained from some distance away, though it is easy enough to clamber through the trees and across many large slippery boulders right to the water's edge. The whole area is continually drenched by spray, which supports abundant mosses and other green plants. The temperature drops markedly, and the noise and power of the cascading water is almost overwhelming. Some way downstream, the creek reforms and flows swiftly through several deep channels for a while before disappearing over the edge of an intermediate cascade and then down towards the lower falls. The majority of people come only as far as the base of the upper falls; beyond here the path becomes very steep again as it climbs a further 1,300 feet up the side of the cliffs, just west of the fall but largely out of sight. Occasionally, spray from the water catches sunlight, resulting in beautiful rainbow-like light effects. At the top, after a walk of 3.6 miles in total, the land flattens out quite abruptly and a stark landscape of scattered trees with much exposed rock stretches out ahead. 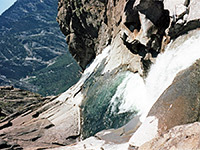 A short spur path that ends with a series of steps cut into a rockface leads to a viewpoint directly above the falls, while the main trail divides - one branch follows the creek and eventually joins the Tioga Road while the other crosses the fast-flowing water on a sturdy footbridge and leads through meadows and woodlands to the east, reaching Yosemite Point after another 0.8 miles then the summit of North Dome 2.7 miles further. Great care must be taken if approaching the creek anywhere near the top of the waterfall; four people are known to have fallen in the water and been swept over the edge.